Okay, I admit it, when I saw the news, I got a little weepy. 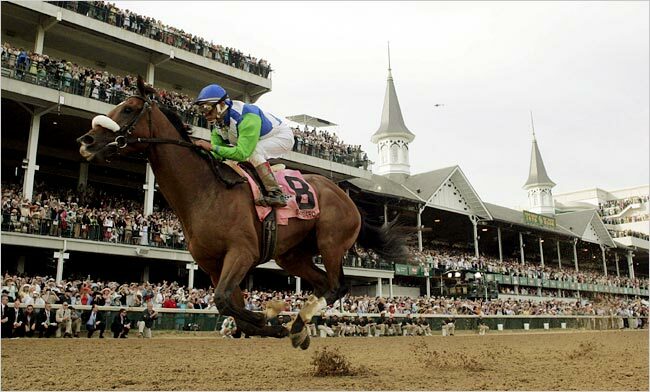 I’ve written before about how the Kentucky Derby kills me every time, and there are times, like watching Barbaro in the Preakness that having grown up surrounded by horses and horse shows, in houses cluttered with boots and tack, having spent most of my childhood in barns with people who live and breathe horses — even if you were a kid like me mostly reading a book over in the viewing room waiting to go home, you wind up with an eye for when something has just gone very very wrong. Which means that sometimes you’re in the basement folding laundry and watching a race and suddenly you can see it, you can see the leg going sideways and you want to throw up. I fully expected them to have to put that horse down right there on the field, and frankly, I thought it was just PR when they took Barbaro away. Big races like the Preakness are full of civilians, full of people who aren’t horse people, the race is on TV for goodness sake, out there for anyone to see. I just figured when they took Barbaro off in that trailer it was so they wouldn’t be doing their business in the road. I never dreamed those owners would put that much money into trying to save a horse that would not only never run again, but that they probably wouldn’t ever be able to breed. Because the bottom line is that it’s still a business. People are trying to make a living, and no matter how much we love them, horses are, in the end, livestock. But those owners, they went the whole way for that horse. Go click on the thumbnail above — just look at that horse. He’s winning the Derby by six lengths — there’s no one else even in the photo. His ears are up, his head is up, he’s flying along having a grand old time. That’s what kills us, all of us, even the ones like me that fled the horse business a long time ago. They surprise us, those horses. You tell yourself they’re just livestock. You tell yourself it’s a business. And then you get a horse like Barbaro, a horse you fall in love with, and you’ll do anything, spend any money, put 28 pins in his leg in the hopes that you can save him. Unfortunately, they couldn’t. But look at that photo at the top. That’s a beautiful thing. That’s the thing to remember. That gorgeous horse running away with a great race. Thanks for the perspective on Barbaro’s death. I wouldn’t have known his story without your piece, and it’s a rare redemptive tale of horse ownership. I grew up riding, too, and while I loathed the Connecticut horse-scene byt the time I was 20, I still get teary at the sight of horse pouring it on, whether in a race or over fences. I still miss the wacky minds and awsome power of Thoroughbreds, but, I’d as soon ride one now as take up skydiving. Unless it were 7/8’s draft horse!